The enigmatically named 28.04 metre motor yacht Z has been listed for sale by Steve Martin at Sanlorenzo Americas. 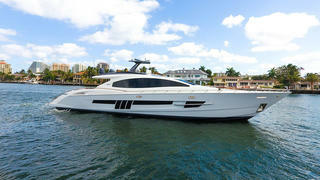 Built in GRP by US yard Lazzara, Z was delivered in 2012 as an LSX92 model. An interior in high gloss wood accommodates up to nine guests in a master suite with a hydraulic sea terrace, a VIP suite, double and twin cabins plus a Pullman berth and all cabins have entertainment centres and en suite bathroom facilities. Large side windows fill the main saloon with light while the opening roof over the helm position allows guests to dine al fresco if they wish. Additional features on this yacht for sale include wooden floors, comfortable furniture, a wet bar, fridge and ice maker while the dining area has seating for eight guests. Z features an extended sundeck plus a hard top over the sundeck and an interesting extra is the fact that the hard top lowers on a hydraulic ram for low bridge clearance. The Lazzara LSX92 model is renowned for its joystick handling of four Volvo IPS 900 engines giving a total output of 3,600hp and a cruising speed of 25 knots, topping out at 31 knots. Lying in Florida, Z is asking $4,275,000.